Chuckwalla lizards are large, pot-bellied lizards which wear a loose, baggy skin. Though the skin appears to be much too large, it is just exactly what this lizard needs when an enemy approaches. You see, when an enemy comes near the chuckwalla, the lizard runs very quickly to a rock crevice and hides in it. In the crack of the rock, the chuckwalla swallows air and blows up like a balloon. When the enemy arrives the chuckwalla is safely wedged in the crack. Though it is within easy reach, it is safe. Years ago, the Indians of our desert Southwest learned how to catch the chuckwalla. They pierced its body with an arrow to let out the air; then the Indians could easily remove the lizard from its haven. Man is probably the only enemy of the chuckwalla lizard from whom it is not completely safe. Many desert plants absorb much salt from the soil in which they grow. The chuckwalla receives enough salt from its food to kill an ordinary animal. The salt would kill the chuckwalla, too, were it not for its special salt-removing glands. These glands are located in the nostrils of the chuckwalla, and, as the salt builds up on the glands, the lizard occasionally sneezes. The sneeze expels the crystallized salt which the glands have filtered out of the lizard's bloodstream. The cold-blooded chuckwalla sleeps late. But when it arises, it must warm up in a hurry. Desert nights and early mornings are often very cold. Cold-blooded creatures are slow and sluggish when they are cold, and cold lizards are easy to catch. For this reason, the chuckwalla wears a dark-colored, heat-absorbing skin. The sun warms the lizard before the air warms up. Later in the day, the lizard's skin changes to a heat-reflecting light color because the chuckwalla must not get too hot either. 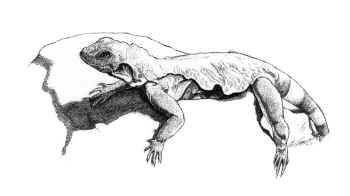 The rationality we find when we examine the chuckwalla's body structure compels us to recognize its Designer. Only God, Who is an intelligent, rational Being, can account for the order and design evident in the chuckwalla lizard and all of nature." DeWitt Steele, Science: Order and Reality (Pensacola, Fl: A Beka Book Publications, 1980), p. 138. Christian parents, do you realize that there are science books that your children can be studying that defend the creationist's perspective?